I know I haven't made many posts lately, but I should be able to pick up a series this season. (Maybe even starting this week for the rest of Koi Chocho!) This will be a shortened version cause doing these posts take too much time that I don't have anymore. Description: Yuuta Togashi suffered from chuunibyou while he was in middle school. When he graduated, he put that dark history behind him and forgot about it... or he was supposed to. High school was smooth sailing and full of enjoyment - until the unavoidable, sad event occurs. The event that locks Yuuta into a contract with Rikka Takanashi and disrupts his desperately ordinary life. Pearz' Thoughts: Eyepatches are in this year! I hear this one is decent so for sure going to pick it up to watch a few episodes. Bern's Thoughts: Boy meets mysterious girl and his precious ordinary life is ruined. How novel! 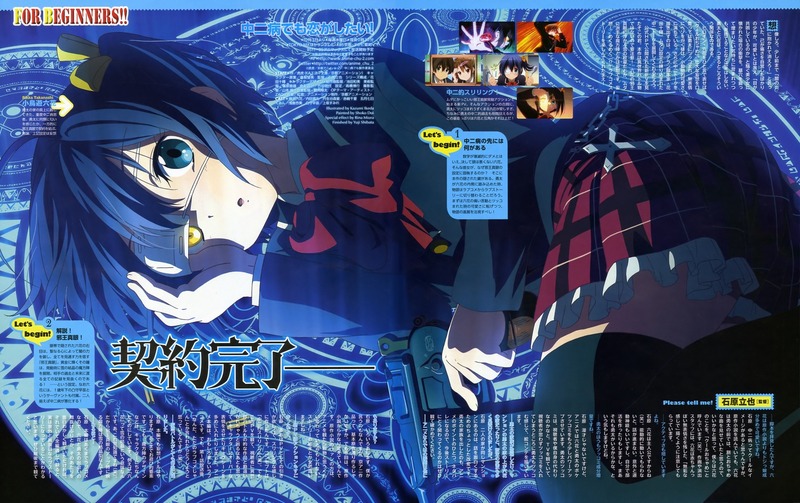 Though I'm not too keen on it story-wise, I'll definitely be checking this out because of Kyoani production values. Djr7's Thoughts: Despite the unoriginal description it seems it'l be a good viewing. Description: Little Busters!' story revolves around the main protagonist Riki Naoe, a young male high school student. When Riki was a child, his parents died, leaving him hopeless and depressed. What saved him was a group of three young boys and one girl his age who referred to themselves as the Little Busters — a group dedicated to fighting evil and preserving justice. 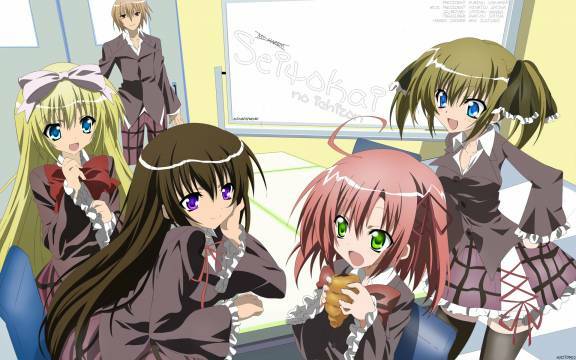 The leader of the Little Busters was Kyousuke Natsume who had a younger sister named Rin. The other two members of the Little Busters were Masato Inohara and Kengo Miyazawa, who are rivals despite being friends. 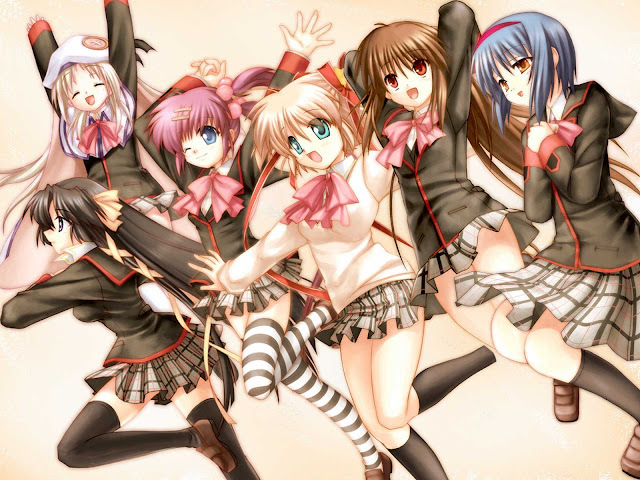 They took Riki out and played together with him during his time of need, effectively making him the fifth member of the Little Busters. In time, Riki really enjoyed playing with them, and his grief over his parents gradually faded away. When the story begins, Riki and his friends are seemingly in their second year of the high school they attend, except for Kyousuke who is in his third year. They still hang out together, and enjoy their school life. Pearz' Thoughts: Another very hyped up anime. I considered picking up the VN a few times as it is fully translated, but isn't watching the anime easier? Better then playing the game and stricken with grief on how bad they butcher it all. Bern's Thoughts: I'm surprised it wasn't Kyoani that picked this up, especially since they did a bunch of the earlier Key VNs. Though JC Staff may not be the best at adaptions, I'll check it out anyway. Djr7's Thoughts: No idea what to think, I will try it out and see if this either has great character conflict and emotional drama over depression, or silly adventures that show no unique development. 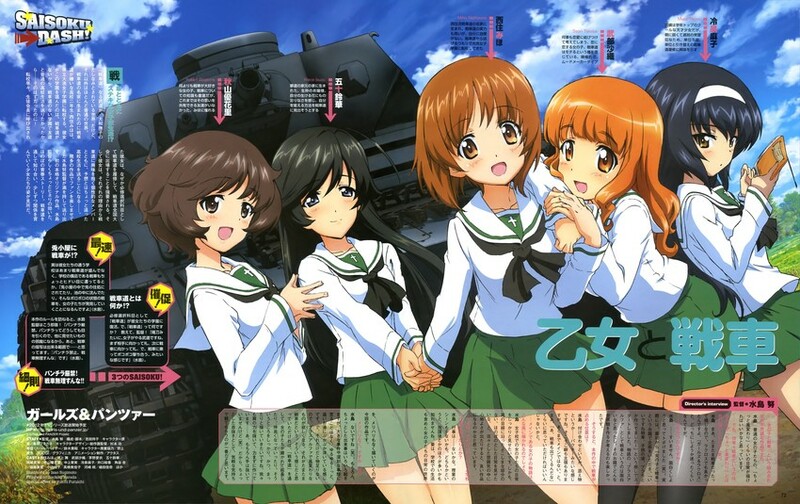 Description: In the world, the manipulation of tanks (Sensha-do) is one of the traditional martial arts especially for girls. Miho doesn't like Sensha-do and moves to Oarai Girl's High School. But the chairperson of the student council orders Miho to participate in the national Sensha-do championship. Bern's Thoughts: Moe girls in tanks? Unless Pearz says something good about this, I don't think I'll be watching this. Djr7's Thoughts: Gahhh, this looks annoying. Description: 2019, Divergence Ratio 1.048596. The near future, where a device popularly called the PokeCom, packaged with PhoneDroid OS, spreads, bringing the Augmented Reality world close to existence. Pearz' Thoughts: Both Chaos;Head and Steins;Gate let me down quite a bit. Both had very strong opening and fails to deliver in the end. Their was quite an improvement from Choas;Head to Stiens;Gate but I still fear that disappointing ending... Being a glutton for punishment, I will probably watch this through knowing I will be let down in the end. Bern's Thoughts: It doesn't seem like R;N VN made as big of a splash as S;G did. I'll still be checking this one out since it's vaguely related to C;H and S;G. I just hope the story doesn't get overly convoluted. It also looks like it'll have better visuals than S;G did. Djr7's Thoughts: Omg, omg, omg. I loved Steins and Chaos, despite the lackluster endings, this will definitely be a great watch if enjoyed the previous two in any way. Description: In the near future, it is possible to instantaneously measure and quantify a person's state of mind and personality. 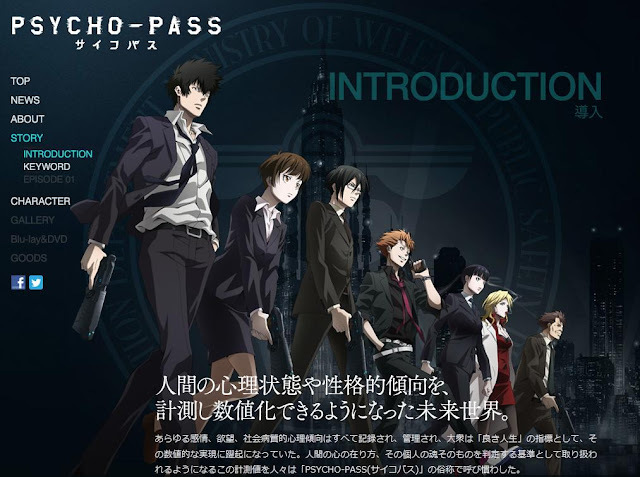 This information is recorded and processed, and the term "Psycho-Pass" refers to a standard used to measure an individual's being. The story centers around the "enforcement officer" Shinya Kōgami, who is tasked with managing crime in such a world. Pearz' Thoughts: Anime originals are always good, especially when it deals with these more interesting themes. I will have to see how good the writer is at creating depth in this but it has quite a bit of potential. Bern's Thoughts: Anime original is definitely a plus. As long as I don't find the sci-fi world that they set up to be too absurd, I think I'll like this. Djr7's Thoughts: Sounds very interesting, this could turn out quite well. Pearz' Thoughts: Nothing else needs to be said, looking forward to this second season for quite some time! Bern's Thoughts: The first season was fun to watch, so I'll be keeping up with this. Djr7's Thoughts: Never saw the first one...am I missing out? That is pretty much list of shows I care about, a few more I might watch an episode of but I'll see once the season starts if anything gets some major hype and I should pick up. There are usually 1-2 every season like that. Oh yea, Djr7's turn! surprised were commenting on so few of the abundant list of shows this new season. Just wanna say I am alive just been busy n whatnot, still gotta catch up on last season but here's some more insight to a few more shows I am excited for. Description: Mizutani Shizuku is the type of person who only cares for her own grades. But when she accidently delivers lesson notes to Yoshida Haru, he becomes convinced they are friends. Haru turns out to have a very innocent personality, but who would have thought that Haru would actually confess to Shizuku? A cold-hearted girl and super-troublemaker romance with a fresh new perspective. Djr7's Thoughts: Reading the description I find myself quite interested as this could very well be a fun show to watch. It looks to be more on the original side on how the two characters will meet and develop their relationship, should be entertaining. Description: Story starts off with 9 boys all in the Hikari Club and are determined to make the ultimate Artificial Intelligence, and will stop at nothing to create it. The leader, Zero, is an attractive boy who is very sick and twisted. He has complete control over the members. The second in command and previous leader, Tamiya, is not happy with Zero controlling everyone and will try to reclaim the leader role. Everything eventually begins to crumble as chaos ensues. Djr7's Thoughts: I gotta say this sounds interesting, the description has me thinking people will die as it "starts off" with 9 boys, meaning there will be fewer near the end. I love hows that have a good sense of darkness, and having a sick and twisted leader controlling people is sure to make for some thrilling or even horror type of moments, of course, I have no idea what the manga is so this is pure speculation. Description:The series follows the action of an arms dealer as well as a child soldier as they traverse the world's arms market in a quixotic quest for world peace. Djr7's Thoughts: I really enjoyed the first season, the show usually covered a story within two episodes as they explained each character with plenty of action scenes. I am highly looking forward to following Koko's crazy arms dealing adventures. Description:The second season about the manga's Flask Plan arc. Djr7's Thoughts: I'm surprised I never wrote up a review of Medaka Box, this show was amazing. It was very funny and had some surprising action at the end, I expect this to have more of that amazing action from the first and keep up the comedy aspects. 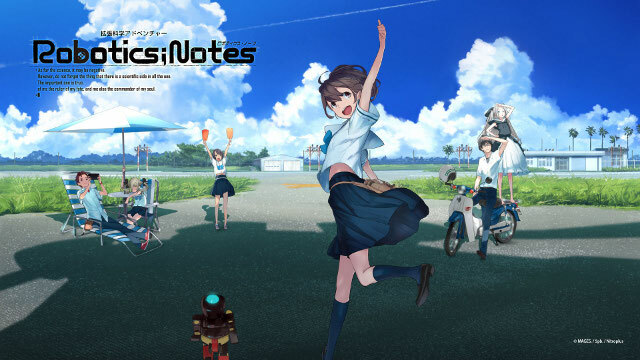 Description: The story centers around Yoshima, an ordinary high school student with a mysterious friend named Mahiro. Mahiro made a deal with a witch named Hakaze to hunt down the killers of his parents and sister. Now, Mahiro is missing, and Hakaze confronts Yoshino. Yoshino fins himself involved in a crisis that may doom the entire world. Djr7's Thoughts: I have always loved the works that BONES brings. This will for sure be one to look forward to. That's all for now, I might add another show or two within a few days, but expect some more weekly blogs about some of these shows as I hope to get back into writing this season.